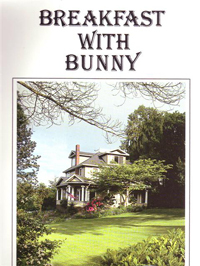 During the 1990s Bunny Cameron was the co-owner of Bombay House, a bed & breakfast establishment on Bainbridge Island. In her book Breakfast with Bunny (1992) Cameron shares many of the recipes she developed during her time as hostess. Cameron says she wrote the book for 'good cooks with little time'. Recipes, which include soups and entrees, can be made from scratch or with store-bought products and most are simple and quick to make. Her personal favorites are dishes that take 30 minutes to prepare but taste like the cook slaved three days at the stove. A copy of Breakfast with Bunny is available at the Bainbridge Public Library.